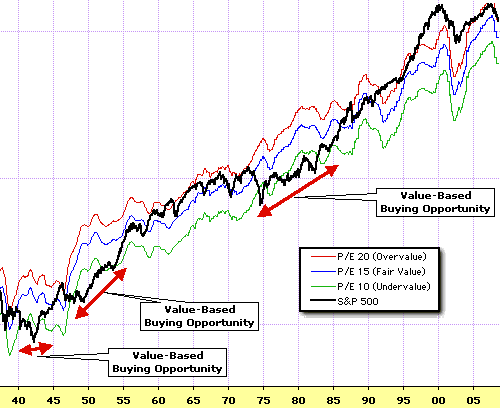 Once in a blue moon, the market trades at prices which take it to a “value based buying opportunity”. But notice that looking back, it hasn’t for a long time. According to this chart, if we do revisit that scenario again, we would be at levels last seen in 1996 (S&P 500 ~650). Which reminds me of this other chart, showing just how low a serious bear market can take prices. I highly recommend Decision Point, the source of the chart above. Thanks to Dr. Brett, you can have free access to their great site until October 26th, 2008. Just login as a regular member would using User ID: magic55 and Password: moments. yes, i seen this too before. it’s very interesting but it’s way way way too long term. one must had been around one of those few timeframes to get in. your blog and others will do. also if going by the rule, one would had missed the majority of the gains of the 1982 to 2000 secular bull market by existing in the early to mid 1990s. oh well, nothing is ever perfect. Here’s something even scarier. Trading down to 650 assumes earnings STAY FLAT and multiples just contract to create value. What happens if earnings continue to decline further and multiples shrink as well? I think it’s telling that we are seeing moves in the market that have not been seen since…you guessed it, the early 1930’s! Hate to see what it would look like with single digit p/e’s. I think now’s a good time to be brushing up on the trading history of the Nikkei. Looks like we are headed down the exact same road making the exact same mistakes. these numbers are somewhat exagerated due to heavy financial part of the index (and big writeoffs). It would be interesting to see the same relationship for NDX or COMPQ, or even DJ. I am sure, lower numbers are in play here. As I mentioned in my blog (here), markets are still very expensive, and with companies profits falling, they are likely to get even more expensive. Another issue is that for constant earnings PE should be the inverse of a reference interest rate. So a PE of 14 is the inverse of an interest rate of about 7%. The lower the interest rate, the higher the justifiable PE. Of course that doesn’t take into consideration the possibility that earnings will increase or decrease. In that case, PE depends on the current value of future earning projections and future interest rate projections, which are both pretty cloudy.